The Cork and Demon: Howdy! 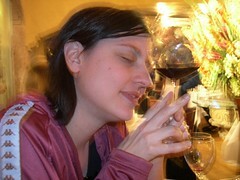 Welcome to the Cork and Demon, the most famous defunct wine blog in the whole history of ever. I haven't written in this blog in a long while, but if you're a fan o' the vino, there's a lot of wine reviews, interviews with wine makers, and travel notes within. Ooh, and pictures--lots of bitchin' pictures. Have at it. If you're fond of my writing, I have a new blog on wordpress called Texistential Blues. This blog is more general, and I'll be yicky-yacking about a wider range of schtuff, including politics, society, food, books, music, and of course, da lovely wine. Please drop by sometime.